Shopclues reported its revenue figures for FY 2014-15 at INR 79.2 crores with a loss of INR 101 crores. 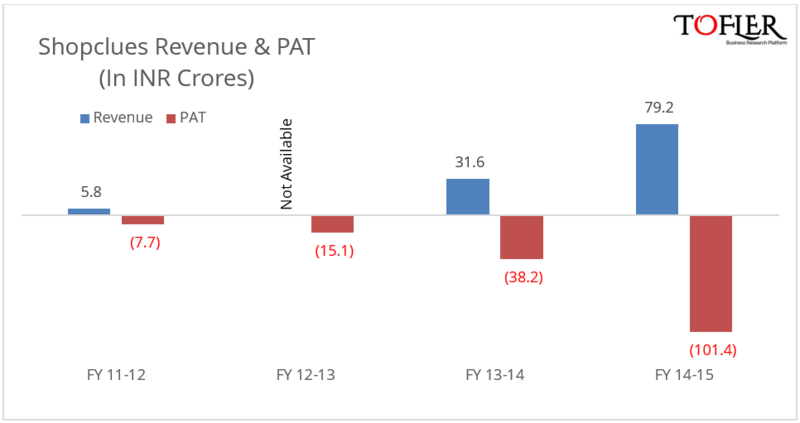 This is a revenue growth of ~150% over INR 31.6 crores in the previous fiscal with a slightly higher increase in the loss figure (INR 38 crores loss in previous fiscal). To put these numbers in perspective, this revenue is roughly half of what Snapdeal’s revenue (INR 168 Crores) was in FY13-14 and while the latter’s loss in the same year was about INR 265 Crores, slightly more than 2.5 times that of Shopclues’ loss this year. Shopclues (Clues Network Private Limited) was founded by Radhika Aggarwal, Sandeep Aggarwal and Sanjay Sethi in 2011. Shopclues.com is an online marketplace and provides a platform to buyers and sellers through their website. It operates in the Indian online retail industry which is dominated by major players like Amazon, Flipkart and Snapdeal. Shopclues offers the customers an online marketplace to purchase retail products, the charges for which contribute to its revenue. Shopclues also offers advertisement and marketing services to the companies on its website. Its home page, category page, all brands page page, etc. are available to publish ads on. Also, it gives the option of email banners, custom designing of viral deals, sponsored listings as well as the option to insert marketing collateral, retail coupon or product samples in its shipping boxes. The biggest expense for the company is their shipment charges (33%). While the company spent only INR 2 crores on advertisements in FY13-14, this has gone considerably up – INR 25 Crores – in this year, probably attributable to use of mass media advertising channels such as television commercials. The following chart and table give a breakup of their major expense heads. Shopclues has been trying to differentiate itself in a market dominated by giants, by focusing on unstructured/ unorganized categories which contributes to roughly two-thirds of its gross merchandise sales unlike other marketplaces, which tend to focus on mobile, electronics, computers and branded fashion. They currently hold a market share of less than 10% in the segment.